On a day when the wind dynamics were very good, but the instability turned out to be insufficient to break a strong cap during the daylight hours, I headed west on I-70 from Edwardsville around 3:00, hoping something might fire before sunset around or just west of Warrenton, MO. It didn't - initiation occurred farther west, just west of COU, and not until around sunset. Whatever show was going to occur with this was happening after dark, and I am not a night chaser - especially in hilly, often wooded terrain, with the storm evolving in the direction of becoming a squall line. I didn't even get any lightning during the chase, but that changed when the line moved through the STL area later that evening. 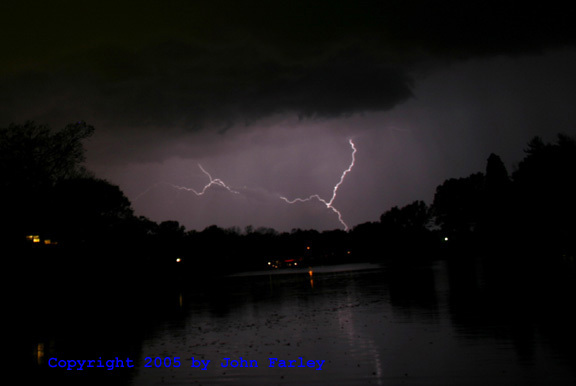 Lightning illuminates updrafts of the approaching storm. CG and CC lightning, as the gust front approaches. Although the storm was not severe in Edwardsville, there were reports of marginally severe hail in the Godfrey and Highland areas. 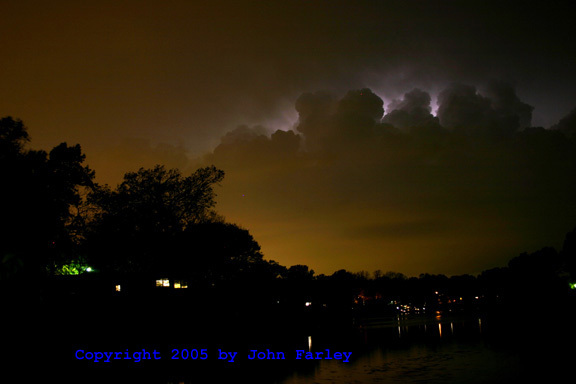 Much later that night, the same line of storms produced the deadly tornado that hit the Evansville, IN area around 2:00 a.m.